Behzad Torabifar developed a model to forecast energy costs. 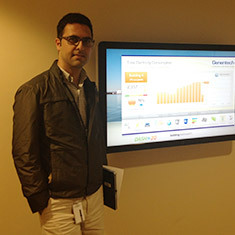 Genentech enlisted Behzad Torabifar to develop a model to forecast energy costs. This tool would be used as a tool to prioritize, justify and finance energy efficiency projects. Torabifar's preliminary investigations showed that the average rate of utility costs varied significantly from $0.10 to $0.25 per kilowatt hour and from $0.60 to $1.20 per therm among 50 buildings on campus based on occupation (administration, R&D and Production). After developing the forecasting model, the energy team was able to calculate the net present value (NPV) and payback periods of the energy efficiency projects for each individual building more precisely. He also helped the Quick Strike Team (QST), a group of Genentech staff, consultants and contractors that collaborate to generate energy savings ideas, to implement approved energy efficiency projects as quickly as possible. Behzad Torabifar, a student at Columbia University, was hired as the 2013 EDF Climate Corps fellow at Genentech.